Desktop Metal Printers are reinventing the way engineering and manufacturing teams produce metal 3D printed parts - from prototyping through to mass production. Current metal 3D printing is too expensive and industrial for prototyping and is just not fast enough or cost-effective enough for mass production. Fundamentally different approaches are needed to move metal 3D printing beyond its current limits, and that’s exactly what Desktop Metal have done. Who uses Desktop Metal 3D Printers? Desktop Metal 3D Printers are widely used in the Engineering and Manufacturing industries for concept design but also end-use-parts. 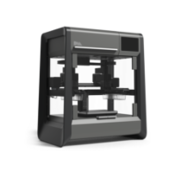 Designed for multiple engineers or product designers to share in the office or on the factory floor- Desktop Metal 3D Printers are used by small to large companies worldwide.